Since the beginning of May I’ve lost over 10kg, many many inches, and I’m probably the fittest that I’ve ever been. I’ve always been quite skinny, and I could get away with eating pretty much anything I wanted without putting on weight. But a couple of years ago I stopped walking to work, and around the same time my wife and I had a newborn baby which meant I was constantly exhausted and paid less attention to what I was eating. Quick and easy was the order of the day. Before I knew it, without even noticing it was happening, I was heavier than I’d ever been, and I was very unfit. Clothing that I’d worn for years was starting to feel very snug, or not fit at all. I finally decided enough was enough. At the beginning of May, my wife and I began to make a conscious effort to improve our health, lose weight, and get fit. It’s not actually been too arduous, and it’s been made much easier by the fact that we’ve been doing it together. If one of us doesn’t feel like working out on a given day, we offer encouragement. We can help each other track our eating, and share the job of preparing meals. We can push through the harder times and celebrate our progress together. Anyway, enough of the preamble. You’re probably wondering what we’re doing to achieve our goals. It’s really a couple of fairly small lifestyle practices that add up to some great results. It sounds obvious, but the big change here is that we started watching what we’re eating. Counting calories can be a bit of an effort (particularly as we cook most meals from scratch), but we did it for the first month to get a better understanding of our intake. It’s also a tried-and-tested way to lose weight. If you have the right calorie deficit every day, you should lose weight. Now it’s become second nature to have smaller portions and make better choices. MyFitnessPal has been excellent for tracking calories, and I’d highly recommend it. I used it initially to calculate a daily calorie intake based on my weight, height, activity level, and the rate at which I wanted to lose weight. I aim for around 1500 calories a day. It’s got a huge database of foods, and it’s easy to add anything that’s not already in there. You can even scan barcodes for ease of entry. We eat very few refined carbohydrates, which really helps when trying to hit a daily calorie goal. No bread. We don’t really eat any rice, pasta, or potatoes. We make the other parts of our meals a little larger to compensate. For example, just make a bit more curry instead of having rice as well. Very occasionally, we’ll have a small spoon of one of the above with a meal, but often we’ll just replace it with some more veg like broccoli. My wife and I have never really drunk alcohol much (I could count on one or two hands the number of times we have it in a year) and we never have sugary soft drinks, so that helps – just tea, coffee, and water. If you do drink either, cutting them out most of the time can be a great way to ditch a tonne of empty calories. Essentially, improving your diet boils down to making better choices. At each meal, particularly if you’re dining out, think about what small tweaks you could make to cut out some calories or make things healthier. We still have treats, we just don’t go crazy. To borrow a phrase from Matt Gemmell, we just don’t routinely overindulge. A lot of people say losing weight is 80% down to diet, and I think that’s pretty accurate. Watching my diet is the main way I’ve lost weight. Exercise is for toning, building a bit of muscle, and generally improving my fitness level. Three pieces of technology have been indispensable to my efforts to get fit: Apple Watch, a website, and a bike. The Apple Watch features three daily activity goals: “Stand”, which requires you to stand for 1 minute each hour for 12 hours of the day; “Exercise”, which requires you to do 30 minutes of activity a day; and “Move”, which requires you to hit a user-defined goal for calories burnt each day. 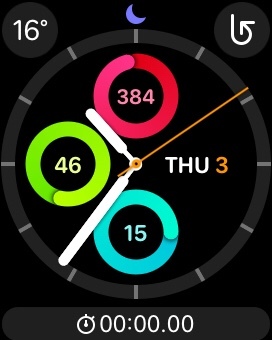 When I first got my Watch, I paid attention to these activity rings. I had a 78 day Move streak going (hitting the goal every day). But then I accidentally broke the streak, and I’ve rarely looked at the activity goals since. It seemed such an effort to get back to 78 days. From the 1st of May, I decided to make a conscious effort to hit every ring every single day. It’s a way for me to force myself to get active each day. 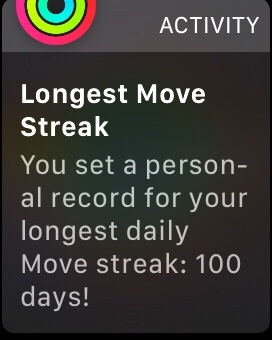 Today marks the 100th day of my new streak, and I really don’t want to break it now. I set my calorie goal low to begin with to set myself up for success, and I’ve been increasing it every week. I’m alternating between two things to hit my activity goals each day. The first is regular body weight strength workouts. We use an online workout plan from the Nerd Fitness Academy. Nerd Fitness provides a simple, structured workout plan which you can do at home with either no or minimal equipment. We’ve worked our way up from ‘bodyweight level 1’, and we’re now at level 3. Each level offers two or three different workouts which you can alternate between. We aim for 3 workouts a week. Each workout consists of a warmup, 3 or 4 exercises which you normally do in sequence and repeat 3 times, and then a cool down. The whole thing usually takes us no more than 15 or 20 minutes, and we’re both much stronger than we were when we started. It’s been great to see just how much we’ve progressed over the last couple of months. The exercises are generally very straightforward; things such as push ups, inchworms, one-arm rows, squats, and lunges. Each exercise also has a really short, simple, well made video showing how to do it correctly. Some days it’s a struggle to start a workout, but one of us can usually motivate the other to get going. It really doesn’t take very long, and we always feel good about it once we’ve actually done it. Our 2 year old son also enjoys joining in and doing his exercises with us. My secret weapon in my goal to hit my activity rings every day is my exercise bike. 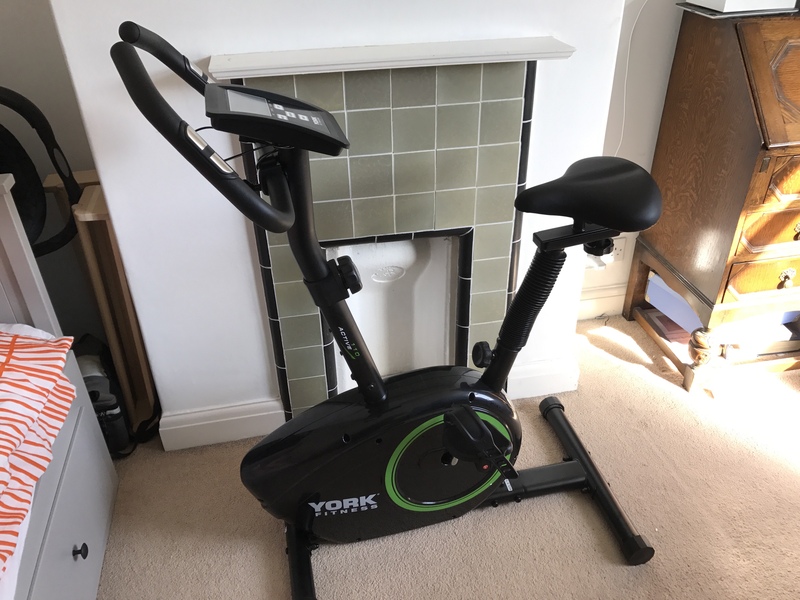 Back at the start of this adventure, with some fantastic advice from Matt Gemmell (you might see a pattern here), I picked up a relatively cheap stationary indoor bike. I primarily use it on the days I’m not doing a strength workout. It’s so easy just to climb on and crank out some kilometers and burn calories. Even if it’s the end of the day and I haven’t hit my goal, it requires almost zero motivation or energy to just walk over to it, get on, and go. If I was relying on running as my daily exercise, I’d be very reliant on the weather and whether I even feel like getting dressed in the appropriate gear and leaving the house. The bike reduces the barrier to entry, and I can’t recommend it enough. I can even prop my iPad on the console and watch YouTube or Netflix while I ride. If you’re looking to lose weight or get fitter yourself, hopefully this post has given you some ideas and inspiration. My inspiration for this post, as well as for me to finally try to get fitter, was Matt Gemmell’s excellent post from a couple of years ago, Workout. Matt went through a similar journey, and the results he saw in six months are just incredible. I highly recommend checking it out.